Robert Oster Turquoise Ink Review & Giveaway! Robert Oster Turquoise Ink is one of Robert Oster’s multitude of ink colors manufactured in Australia. Even with more than 100 ink colors, Robert Oster inks are each individually unique and interesting. Their inks are named with an eye to Australia’s magnificent beauty and color palette. Most have alluring names such as Verde de Rio, Envy, Aussie Brown, Purple Jazz and Blue Water Ice. 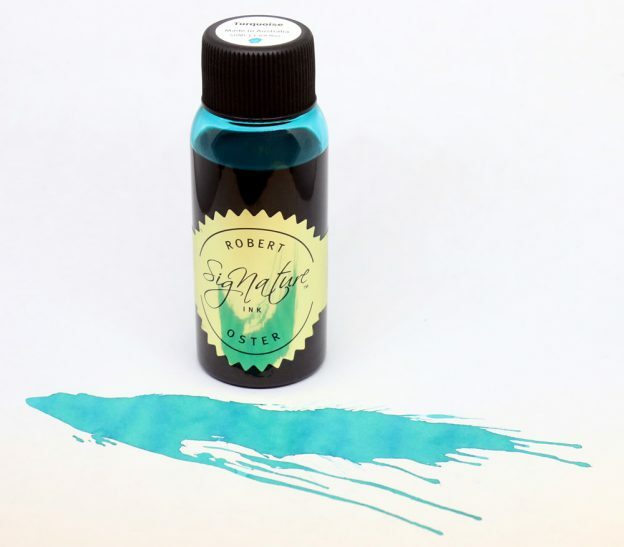 However, this review is of one of Robert Oster’s few “basic” ink names, Turquoise. There is a host of turquoise fountain pen ink on the market today. Each is a bit different, but most are a vibrant light blue, with a slight shade of green. For this reason, Robert Oster Turquoise ink is unique compared to other turquoise colors and is much lighter than most turquoise inks we have reviewed. Robert Oster must have imagined Australia’s magnificent crystal clear waters when creating Robert Oster Turquoise ink as it is reminiscent of the shallow waters found in Australia’s amazing beach locations. Robert Oster Turquoise ink is beautiful, shows up well for a light colored ink and has light to medium saturation. During our review of Robert Oster Turquoise ink we found the following characteristics that you may find helpful when picking your next ink color. Continuing reading for a chance to win the bottle of Robert Oster Turquoise ink we used for this review. We used a French-made J Herbin glass dip pen, which has a tip equivalent to a fine-medium fountain pen nib on Rhodia dot pad paper. Different pens and paper may produce different results. All Robert Oster Signature inks come in a standard 50 ml. plastic bottle. Each bottle is identical with a distinguishing label that has ink color and ink swatch on top. The no-frills Robert Oster ink bottles are very functional and we have never experienced leaking problem. Robert Oster Turquoise ink retails for $17.00 in the USA. Robert Oster’s Other Shake ‘N’ Shimmy ink series retails for a bit more, but overall they are a mid ranged priced ink option. Each bottle of Robert Oster Turquoise ink is imported directly from Australia. During our review of Robert Oster Turquoise ink, we experienced a dry time of approximately 6-7 seconds using a glass dip pen. This is a very reasonable dry time allowing this ink to be used in most situations. 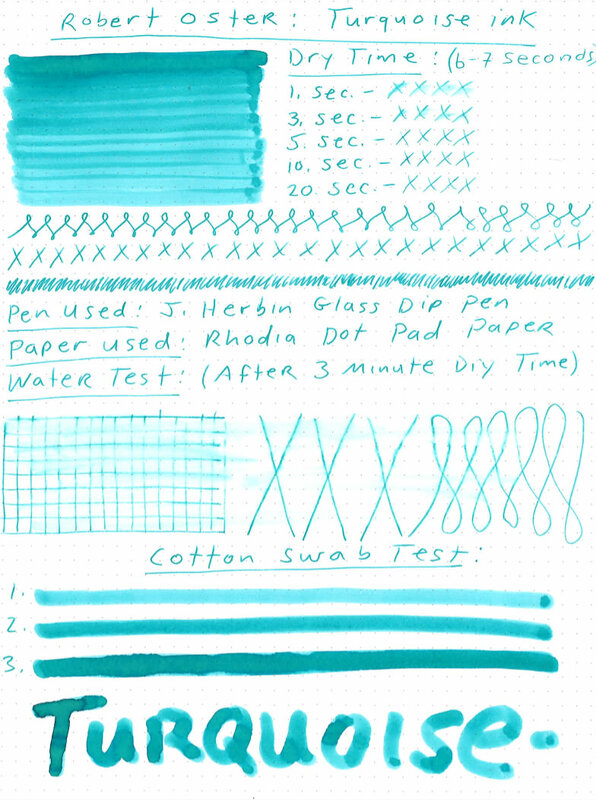 During our review of Robert Oster Turquoise ink, we found no bleeding, even during our water and cotton swab tests. We found no feathering during normal use on Rhodia paper during our review of Robert Oster Turquoise ink. We conducted a water test where we ran a wet cotton swab over an ink sample of Robert Oster Turquoise ink that has dried for about 3 minutes. The results of this test were a light color smear, slight line distortion but most lines remained legible and clear. Robert Oster Turquoise ink is not waterproof ink, although it held up reasonably well under our water-test. Robert Oster inks are well known for being great shading inks and Robert Oster Turquoise ink will not disappoint. It produces a bit of color variation depending on the nib and paper used in addition to the writing style of the writer. There is a deep green-blue turquoise color to a very light dusty blue color with very little green hue. The color combination is very beautiful and not a typical turquoise colored ink. A very wet line may produce a slight black sheen outline, which we noticed during the cotton swab test. Robert Oster Turquoise ink is a unique lighter turquoise color than other ink company’s version of turquoise. It has quite a bit of color variation and shading that is possible with the right nib and writing style. It is reasonably priced, especially considering each bottle is imported directly from Australia. Finally, it has a reasonably quick dry time, making it available for use in most situations including at home, office, letter and journal writing. Happy Writing from Australia! This entry was posted in Fountain Pen Ink and tagged fountain pen ink, Giveaway, review, Robert Oster on January 15, 2019 by Pen Chalet. Very pretty Ink! This turquoise is a stunning colour! God Bless & the Love of Christ to you all!! Such a lovely tropical ocean blue! Robert Oster inks are my favorites! Before the recent bounty of ink colors I primarily oscillated between Black, Blue-Black, and Skrip’s Peacock Blue. I love turquoise and currently have eight inks that I categorize as turquoise. If the color on my screen is close indication of this ink’s color, then this turquoise could rank among the nicest. I have six different colors of Robert Oster’s Signature inks, I think that more than enough to know that quality is assured. This ink is definitely on my personal wish list. My favorite ink is Diamine Lilac Satin. What a beautiful color. That would fit perfectly with my TWSBI Eco Turquoise. Nice color. I find Robert Oster to always be fountain pen friendly! I’d love to see a review of Diamine Shimmertastic Razzmatazz. This is a beautiful shade of turquoise! I don’t really have a favourite ink, it’s more about the color for me. As always, would you review some of the old standby inks such as Sheaffer, Waterman and Parker. Love Robert Oster Inks and would love to add this turquoise to my lineup. Thanks for the chance. It’s interesting to me how both the reviewer and I received a vision of a ‘crystal’ beach when looking at this ink. Usually, colors like this might pop out like a highlighter, but this seems more relaxed (due to the shading qualities?). The blue-green range is nice, and is especially noticeable with greater ink applications like cotton swab test #3, and a few of the larger letters at the bottom such as the T and R. Seeing this detail makes me wonder what brands of inks may be capable of producing noticeable textures with even fine and extra fine fountain pens. I wonder, is there anything that may fit the bill? I would be happy to see more reviews for inks best suited to F and EF pens, as those are the kinds I most frequently use. Very nice! Thanks for the review. Awesome, thanks for the giveaway. I’m beginning to realize I think Robert Oster may surpass Pilot Iroshizuku as my favorite ink brand. Would love to add this to my 4 bottles of Robert Oster! Thanks for the thorough review – looking forward to more R. Oster inks! This color is absolutely gorgeous! I do not have this in my collection. Thank you for the giveaway, Pen Chalet! This looks like a great and unique turquoise! I’m sure it stands up to the quality of all Robert’s other inks! I love Robert Oster inks and this one looks like it’s no exception! Thanks for the opportunity! The only turquoise ink I have is Lamy Pacific. Robert Oster Turquoise would be a nice addition to my ink collection. Please review Lamy’s new Peridot! I love Robert Oster inks. I need more of them.